Moms deserve a break from cooking and a mimosa Sunday. To help families honor mom, several restaurants are offering free treats, Mother’s Day meals and discounts. Many more restaurants are offering savings through gift card promotions. And one of the best deals is available everywhere mimosas are served. 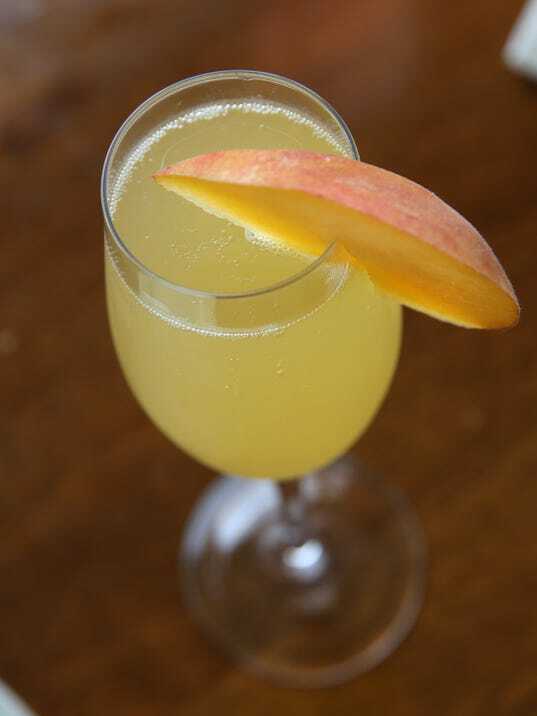 Smartphone app Ibotta is offering moms across the country a free mimosa Sunday at all bars and restaurants through a special cashback rebate. The “Mimosas for Moms” rebate will be available all-day Sunday for new and existing users under the “Restaurants and Bars” category. After buying the cocktail at any bar or restaurant, upload an itemized receipt to get up to $5 cash back added to your account. Once you earn $20 through the app, which also offers rebates on groceries, online shopping and more, you can transfer money to a PayPal or Venmo account or choose a select gift card. Be prepared for restaurants to be busy. Brad Plothow, vice president of brand and communications for Womply, a small business software provider, said 44% of all restaurants reported Mother’s Day as the top sales day of 2017. “While people grill at home on July 4, have friends over for the Super Bowl … the cultural norm for Mother’s Day is to take mom out for brunch or dinner at a restaurant of her choice,” Plothow said. Unless otherwise noted, these deals are available Sunday at participating locations. Abuelo’s: The Mexican restaurant chain is giving away gifts to moms at all locations Sunday. Gifts vary by region and options include free shirts, flowers or a free entrée bounce back card. Another Broken Egg Cafe: Moms who dine-in Saturday or Sunday get a free $10 Brunch Buck to redeem May 14-27. Arooga’s: Moms eat free with a purchase of another meal and a beverage. Dine-in only and limit one discount per check. Burger 21: Through Sunday, any mom who shares a family photo or embarrassing story about their kids gets a free small shake. Learn more at www.facebook.com/Burger21. Chicken Salad Chick: On Friday and Saturday, the first 100 moms at every restaurant will get a free “sweet surprise.” For the two days, the Perfect Pair special, which includes two scoops of chicken salad, egg salad or pimento cheese, will be $5.99 and there will be other specials and giveaways throughout the weekend. Duffy’s Sports Grill: Moms get a free glass of wine and a $10 MVP bonus added to their rewards account to use on a future visit through June 16. Sign up for the MVP loyalty program at www.duffysmvp.com. El Fenix: Moms get a free Sopapilla with purchase of any entrée Sunday. Choose from regular, strawberry paradise or chocolate caramel. First Watch: Moms get a free box of chocolates while supplies last. Fogo de Chão: Moms who dine in between 11 a.m. and 9 p.m. Sunday get a dining card for a free meal to redeem May 14 through July 12. Plus, kids 6 and younger dine free and ages 7 to 12 are half price. Free movie: Twenty-five theaters will show free sing-along screenings of Mamma Mia! at 10 a.m. Sunday. Free tickets are available on a first-come, first-served basis and may only be picked up at the theater box office starting at 9 a.m. Learn more and find participating locations at www.mammasdaysingalong.com. Hooters: Moms choose a free meal from a special Mother’s Day menu with any drink purchase at participating locations. Free menu item options may vary by location and some locations will offer a buy-one-get-one free deal for moms, according to a news release. HopCat: Moms get a free order of the chain’s award-winning Crack Fries with any other dine-in purchase. Hot Dog on a Stick: Moms get a free turkey or veggie hot dog when they mention the post on the chain’s Twitter, Facebook and Instagram accounts. LaMar’s Donuts: Moms get a free regular doughnut including the chain’s Red Velvet Cake Donut and a free small coffee. Lucille’s Smokehouse Bar-B-Que: Moms who dine-in Friday through Sunday get a free $10 bonus card to redeem May 14 through July 14. Medieval Times Dinner & Tournament: Through Sunday, mom is free with the purchase of one full-priced adult with code MOM18. A Mother’s Day package upgrade, which includes a “Mom’s the Queen” sash, souvenir glass of champagne or mimosa and framed photo, is available for $20 during checkout or at the door. Orange Leaf Yogurt: With a coupon, moms get free frozen yogurt at participating locations. Options vary. Set Price Cup locations will give a free beginner cup Sunday and Weigh and Pay locations will give $3.30 off. PDQ: Moms eat free with purchase of any meal, bowl or salad at all locations. The free meal includes choice of a combo meal, a salad with 20-ounce beverage or one free bowl with beverage. Rocco’s Tacos & Tequila Bar: Moms get a free house margarita during brunch or dinner and kids under 10 eat free from the kids menu at the seven Florida locations. Roy’s Restaurant: To celebrate chain’s 30th anniversary, each table Sunday gets a $30 dining card to use May 14 through June 15. Restaurants also will open at 9 a.m. Sunday for a special three-course brunch and the special dinner menu starts at 3 p.m.
Ruth’s Chris Steak House: Moms get a free $25 dining card Saturday and Sunday that can be redeemed May 14 through July 1 at participating locations. Some exclusions apply. Shoney’s: Moms get a free slice of strawberry pie with purchase of a buffet or entrée. Spaghetti Warehouse: Moms who dine-in Sunday will get a coupon for a free 15-layer lasagna to use on their next visit and can enter a contest for a chance to win $1,000. TCBY: Moms get their first six ounces of frozen yogurt free at participating locations Sunday. Texas de Brazil: Moms dining in Sunday get a $20 certificate to redeem on two dinners Monday through Thursday between May 14 and July 31. Most locations are opening early at 11 a.m.
Tijuana Flats: Moms get a free entrée Sunday at participating locations when they show the offer from email, Twitter or Facebook. UFC Gym: Friday through Sunday, UFC Gym signature locations across the country are offering free workouts for moms and their families. Find locations at www.ufcgym.com. Wienerschnitzel: Moms get a free chili dog, small fries and soda with proof of “Mom-bership.” To show proof, moms can bring their children to the restaurant, present a family photo or share a favorite family story or memory with restaurant employees. More deals: Locally-owned businesses also will treat moms to freebies and one of the easiest ways to find out is to check restaurants’ social media channels. Bass Pro Shops: From noon to 5 p.m. Saturday and noon to 4 p.m. Sunday, get a free 4-by-6-inch photo at the outdoors store. Plus, on Sunday, the first 100 to get their photo taken get a free accessories bag and sunglasses case. Limit one per family, while supplies last. Learn more at www.basspro.com. Cabela’s: From noon to 5 p.m. Saturday and noon to 4 p.m. Sunday, get a free 4-by-6-inch photo at the outdoors store. Learn more at www.basspro.com. J.C. Penney: From 11 a.m. to noon Saturday, kids can decorate Mother’s Day flowers during the department store’s monthly Kids Zone program. Children must be accompanied by an adult and parents will receive an extra 10% off coupon to use Saturday. Michaels: From 10 a.m. to noon Saturday, the arts and craft stores have two Kids Club “Flowers for Mom” programs. The cost for kids 3 and up is $2 per project and kids 6 and up $5 per project. Learn more and register at www.michaels.com/classes.